Adventurer in Training | Get out there and live. ~ Get out there and live. Last week I felt like a bona fide adult. I started my 401(k). I did taxes. 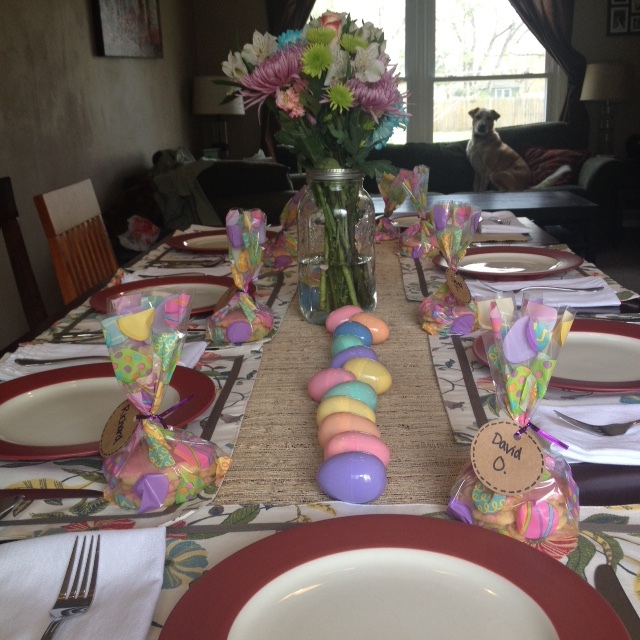 And I rounded out the week (the week starts on Monday in my head) by hosting Easter at our house. Also, I feel like a true grown-up because I just used the word bona fide (and correctly, too!). I don’t host many holiday celebrations at our house. I do New Year’s Eve and Easter (and maybe a Father’s Day thrown in there). Quite the combination, right? I don’t feel the need to tackle the really big ones (Thanksgiving and Christmas) until I have to. New Year’s is a big friend-centered party for us. We usually have 20+ people in our house and 10 or so stay the night, too. Easter on the other hand is a small affair just with family. 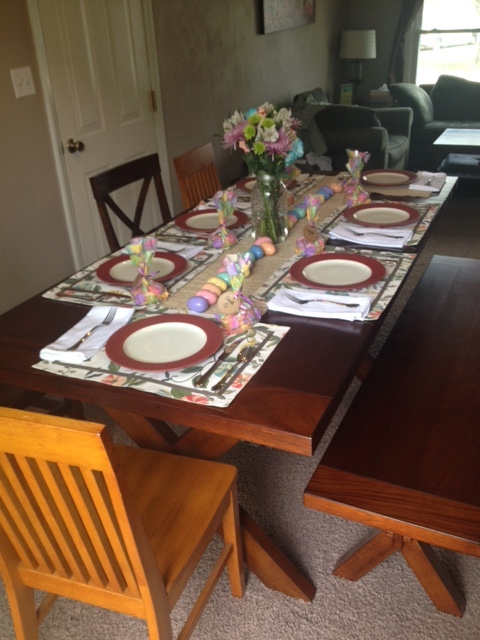 It’s funny I’ve chosen Easter as a holiday to host a get together. I’m not religious really. I can’t remember the last time I went to church, let alone on Easter. But I also don’t believe we should go about it like an ordinary day. David and I enjoy seeing family when we can and having an excuse to clean the house, so we figured this would be the perfect opportunity. This was our second time hosting Easter. The last time was back in 2013 (last year we were just getting back from our Disney vacation in Florida). 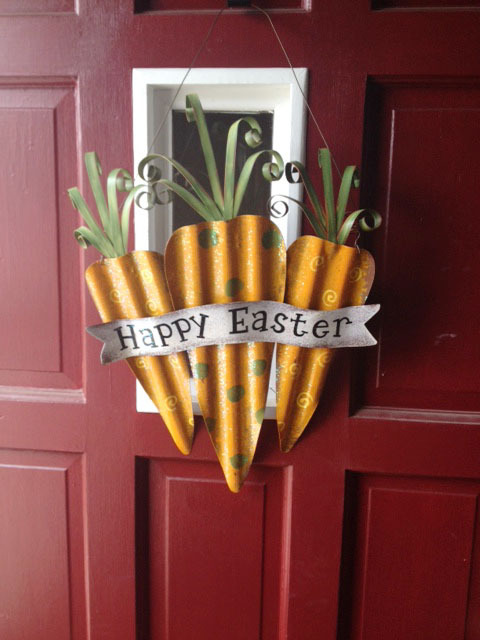 I snagged the opportunity to buy some festive supplies: pastel plastic eggs, candy to fill the eggs, a cute carrot door hang, and some treat bags. Usually procrastinating is looked at as a bad thing, but it always works in my favor when buying last-minute holiday items. All items were 40% off at Hobby Lobby! Although, I sadly, can’t say the same thing about the candy I picked up at Target. This year I decided, or, well, David gently pushed me, to do a ham. I have never cooked a ham before. My mom has always said it’s so easy. But she has had years of experience with this entertaining thing, though. And then she told me something that completely changed my point of view: the ham is already cooked — you only have to make sure it’s heated through. Mind blown. I feel a little dumb I didn’t know this before. My worries of undercooking it and giving our guests food poisoning? Gone! At this point, I’m thinking: hey, this is foolproof. I chose a crockpot ham recipe I had found after doing lots of Pinterest surfing at work (our lull at work happened at the perfect time). I wanted the oven free to use for the green beans, sweet potatoes, and crescent rolls that were on the menu, too, that day. The crockpot worked out so well. David bought a 9.75-pound ham at Costco. We rubbed brown sugar and mustard on it, drizzled maple syrup all over it, dumped pineapple juice at the bottom, and (barely) placed the lid on it and cooked it on low for 4-5 hours. (For the precise amounts of each ingredient and directions and such, see the full recipe here.) We had to wake up early to start it, but after it was all assembled and plugged in, we headed back to bed to catch another hour of sleep. This was the first time I had ever attempted to put multiple things in the oven that are supposed to cook at different temperatures. It only worked out OK. I made these green beans (minus the parmesan) and roasted cubed sweet potatoes (following steps 1 and 2 here). And then I popped the crescent rolls in there, which then proceeded to cook unevenly. Ugh. But luckily (and this is one of the best perks about family), no one seemed to notice or care about the rolls or how we were eating 30 minutes later than intended. They were patient and gracious and even commented about how good the food was. It was then I breathed a sigh of relief and then let myself relax to enjoy the meal and the conversation. 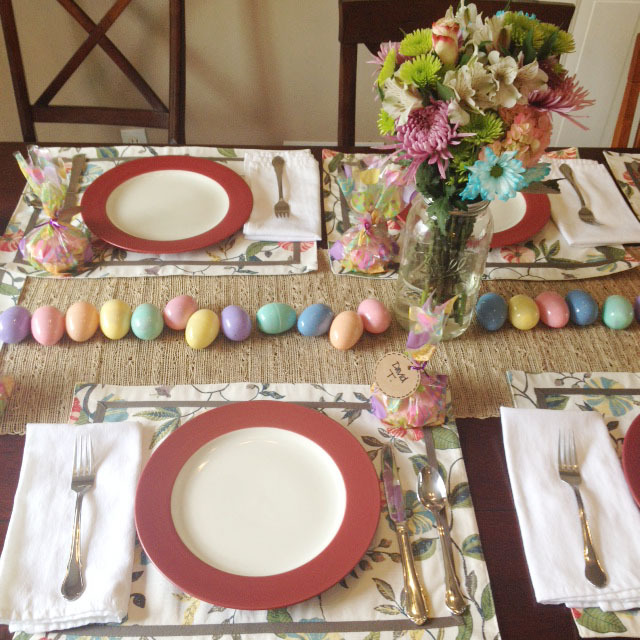 While it was fun to plan the menu and cook, my favorite part was decorating the table. I used the excuse it was Easter to get fresh flowers. 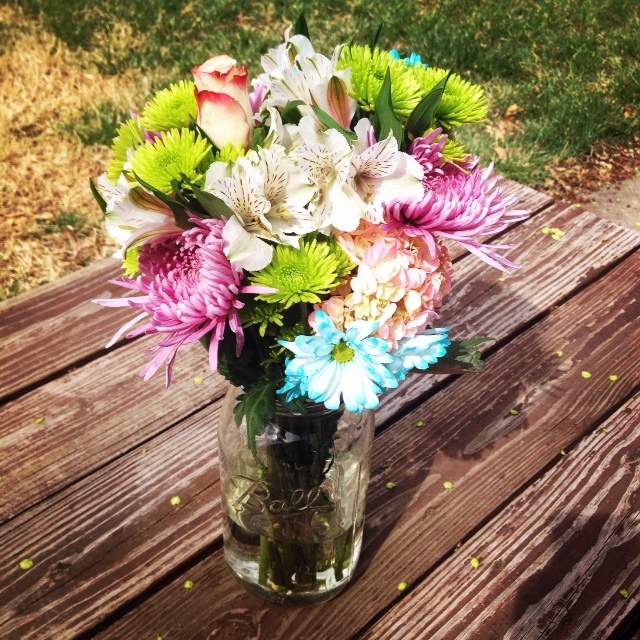 I found a giant Mason jar we had in the kitchen and used it as a vase. I couldn’t stop staring at it. It was that pretty. I wanted to bake sugar cookies and ice them. Cookies didn’t seem like a good group dessert, though, so I made another one for after the meal (applesauce cake). I used the sugar cookies instead as placecards. I placed 3 pink-iced sugar cookies into each treat bag and attached a name tag to each bag. A sweet treat that doubled as functional! Dexter decided to jump in for a picture. Don’t worry, I did put away the random Target bag before our guests arrived. We had 7 people total over for lunch. Our dining room table only seats 4 at the moment (we need to invest in some more chairs! ), so we pulled in chairs from other areas of the house. The weather was surprisingly gorgeous. When I think of Easter, I think of it being cold, cloudy, and maybe even a bit drizzly. But no, not this Sunday. It was sunny and around 70 degrees. We had the screen door open in the front. All in all, I think it’s safe to say the afternoon was a success — my dad and brother-in-law fell asleep on the couch. By golly, I think I’m getting the hang of this entertaining thing.